Hi Luc, really enjoyed this blog, very informative and nicely paced. I don’t know the exact figures, my guestimate based on sites I have worked at in Australia, 80% of SAP ERP customers use Sharepoint for their horizontal Portal, given those numbers you can imagine Microsoft SAP Interoperability is a hot topic. Microsoft and SAP recognise this and they have jointly developed “Duet Enterprise for Microsoft Sharepoint and SAP”, this collection of tools and services provides the mechanisms for process and content collaboration between the 2 vendors product suites. For a lot of companies the technical pre-requisites and skills needed for DUET form a barrier too high. What you have shown is a nice simple affordable alternative. Nice one. Thanks for your perspective! Indeed, I completely agree that client side integration can often provide a more cost-effective and easier-to-implement alternative! Could you please tell me if we can have charts feature in SAP UI 5? The current version of SAPUI5 doesn’t contain any charting controls, but it should be easy to integrate exisiting JS chart libraries like highcharts or fusioncharts. Thankyou for the great blog. Interesting info on sharepoint. 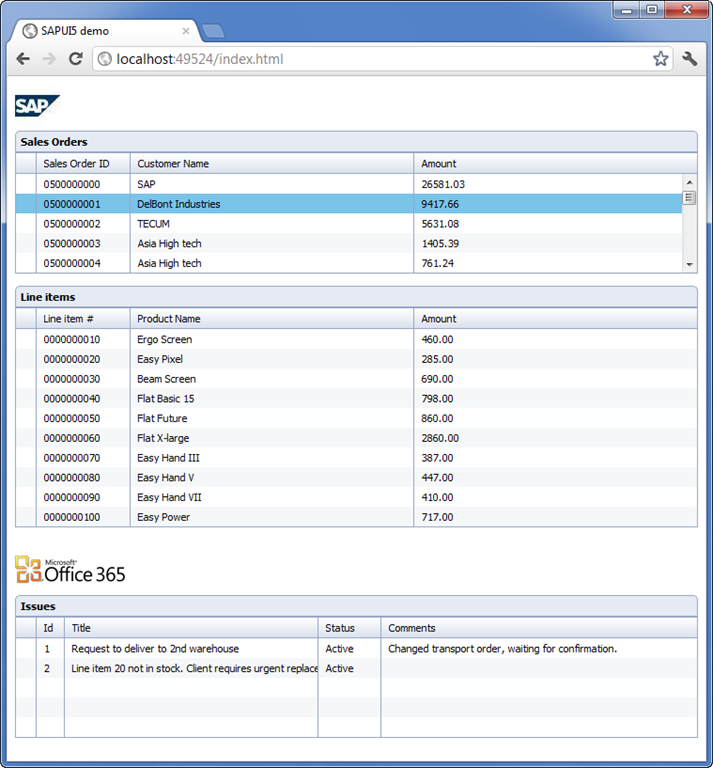 And I agree with the previous comment – most SAP customers that I have worked for also use Sharepoint as their main portal and just use the SAP Portal for ESS/MSS Access only. Great blog and a good starting point to learn a lot of things. But when i try the same at my machine i am not successful. Sorry i am new to Java. And till now my focus has been only abap. hence the question. I have tomcat_eclispe installed and i am trying to copy your code into a j2ee project in eclipse. XMLHttpRequest cannot load http://xyz:8010/sap/opu/sdata/sap/GURU/zguru_testCollection?$skip=0&$top=100&$inlinecount=allpages. Origin http://localhost:8083 is not allowed by Access-Control-Allow-Origin. could you please spare some time to help me with this ? Did you get the the first test described in the article working (i.e. 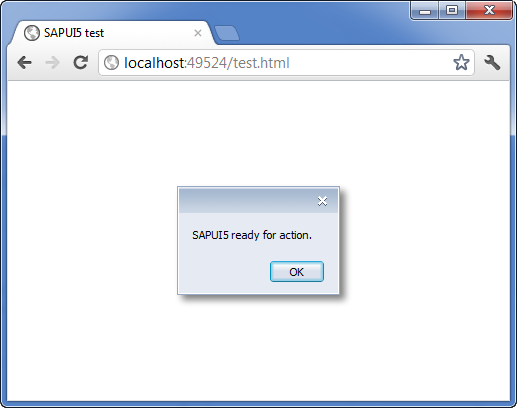 using SAPUI5 without trying to access SAPGW) ? The error message seems to suggest an issue with Same Origin Policy. You must ensure that the initial HTML file and the SAPGW endpoint are on the exact same domain, port and protocol. If not, you can try using Chrome with –disabled-web-security command line option as described in the article. I am reading this with interest and certainly learning a lot – thank you. My questions is when would you use this interface for your mobile application vs some other platform like Sybase Unwired Platform. SAPUI5 is (currently) not suitable for mobile. To create mobile apps on top of SAP Gateway, you can use any of the leading HTML5 mobile frameworks (Sencha Touch, jQuery Mobile, etc,) or go native. 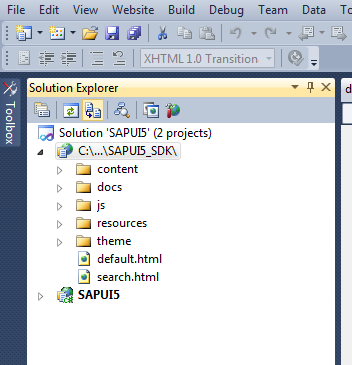 EDIT: SAPUI5 now (Oct 2012) contains widgets for mobile device. See comment from Ruben below! the current version of SAPUI5 contains a “sap.m” package that contains special mobile controls (for mobile devices that are not tablets). The other packages are compatible with tablets as well – not only with desktop browsers. FIrst of all thanks for the wonderful blog. Gave a lot of insight into the SAPUI5 world. I have made a similar scenario as the example provided by you, but whenever I try to addColumn with a TextView template to a DataTable, the error “Error: ‘type’ is null or not an object”. Also could you plase tell me if specifying the binding property of the OData (in this case fName) should be specified in curly brackets or just using quotes? Wowww that really fixed with the error. Now I dont get the type error anymore. Thank you so much. 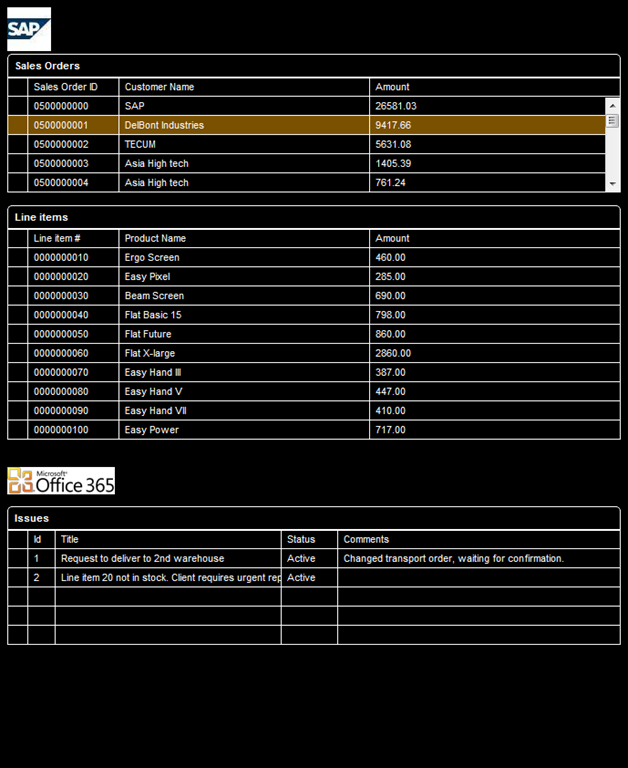 Now the table is rendered on the page but without any data. And yes fName is the name of an attribute in the model. but Somehow the binding is not being done. Hi, I suggest to have a look under the hood with Fiddler if the request is sent to the server and if you receive an XML response. Could be several issues: cross-domain request, authentication failure, …. 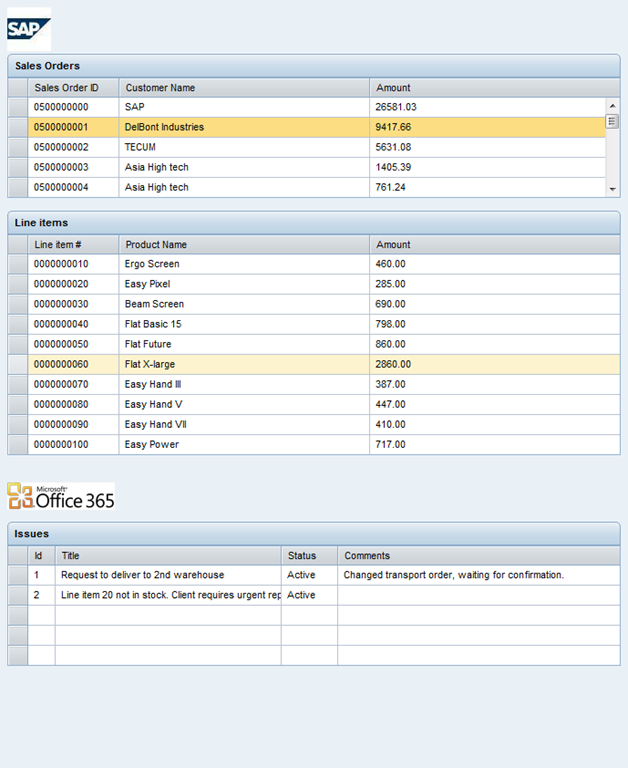 Thanks for a great blog..it really helped in getting started with Ui5…was able to create the first app succesfully, however getting some issues with the Sales Order Example. do you know what could be wrong here? Appreciate if you could guide. IE doesn’t know about forEach. Try a regular for loop instead. I expect you will run into SOP issue, because IE will not allow you to do a xhr request to another domain. That’s why I use chrome with web security disabled. Thanks a lot for your prompt reply. How do I use a for loop, what would be the syntax…could you pls help with the code snippet. Hi, when I use visual studio 2012, my table doesn’t get filled using a gateway service; When I use the same code in SAP GUI or Eclipse, the table gets filled. I tried also with google chrome (security disabled). Do you have any idea what could be wrong? I don’t understand what you mean by ‘when I use visual studio 2012, my table doesn’t get filled”? This is browser side code. You should use chrome with –disable-web-security flag or deploy the initial HTML on the same address and port as the gateway. If Chrome doesn’t work like expected, I suggest to use Chrome developer tools to further diagnose the error (e.g. authentication, cross site, …). Hello! Could you help me please. I’m trying to do your example, but I have not retrieved any data 😦 I’m running google chrome with –disable-web-security. P.S. There are no errors in console. Try using Chrome developer tools and see if/what requests are sent to server. Same issue here. $metadata is read but there is no request going out to the gateway to fetch any data. Since I don’t have access to a sharepoint list I commented this part out. The Gateway Part should run, though. I tried with the below code but it shows no da. Awesome blog it is, very helpful. I am working on an app for SAP itself. 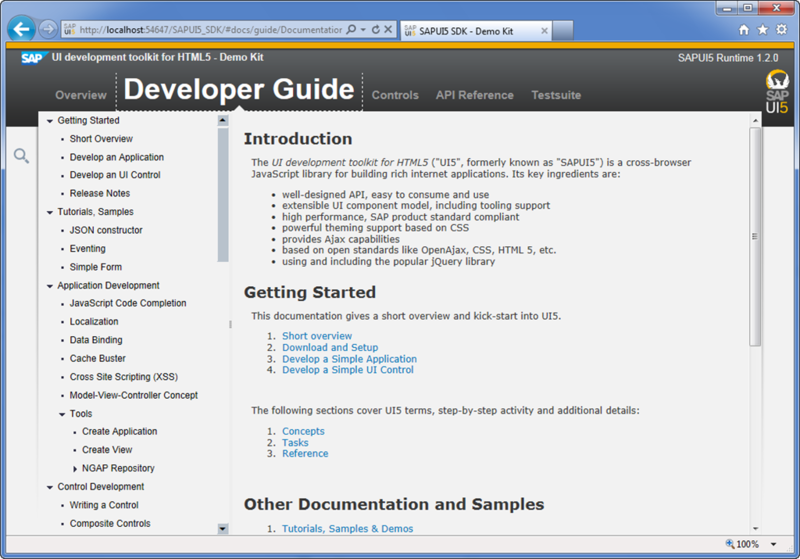 I was able to successfully integrate SAP UI5 with Visual Studio 2010 with the help of this blog only. I wanted to know if there is possibility to get the intellisense/code completion in visual studio also for SAP UI5 controls? It would be very helpful if we can get that. I tried to achieve this by including “jquery-sap.js” and “library-all.js”, doing so it reaches till sap.ui.commons but after that not showing intellisense for UI controls i.e. buttons, listbox, labels etc, instead showing some Renderers for each control. May be I am missing some required js file which should be included in the page to get the intellisense for UI controls too. 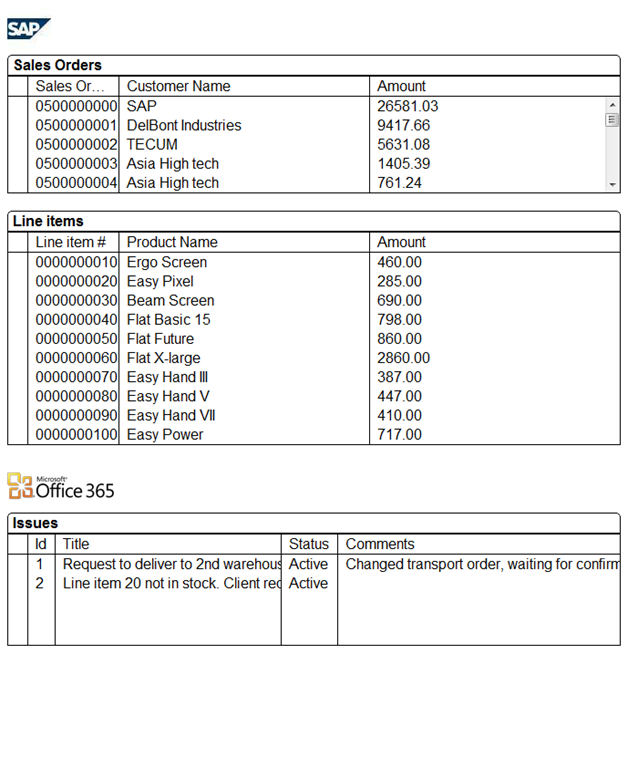 shall you guide me how to do the same….without any gatewat and get a jason data to retrieve sales order ? Very well detailed post, and I thank you for it. I am working on a PoC where we want to develop UI5 applications, and call them in / from share-point. 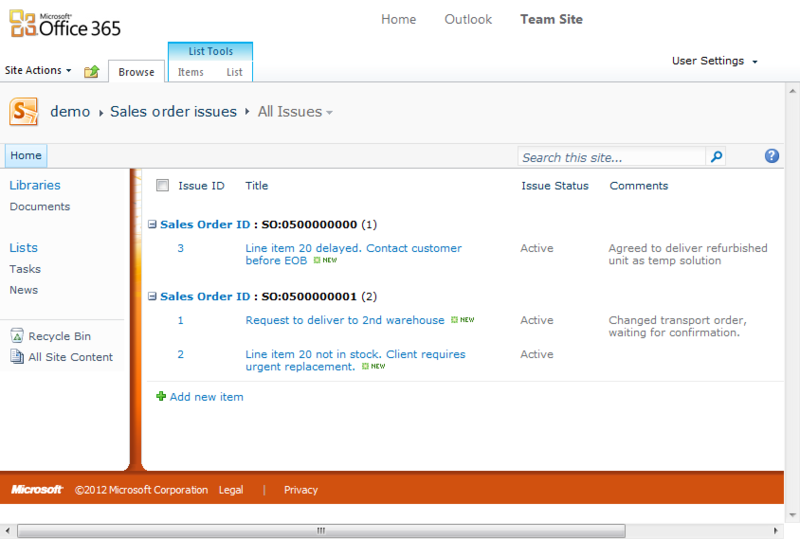 It should also inherit the sharepoint theming / branding. Any idea how to do this? I know I can assign a custom theme to UI5 applications. I have achieved that at generic as well as control level. I don’t know anything about sharepoint and whether simply hosting/porting or UI5 application in sharepoint will provide the same branding as sharepoint.